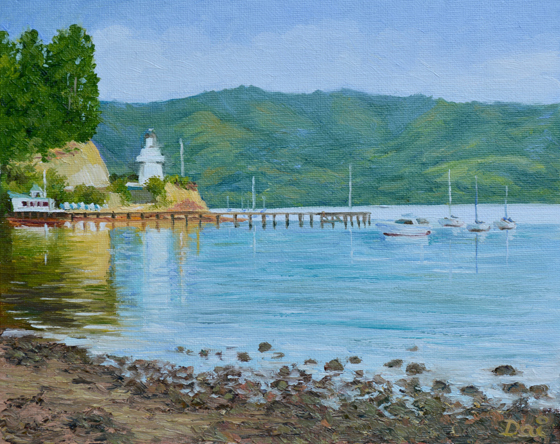 Akaroa Yacht Club beside the historic wooden lighthouse on Akaroa Harbour, Banks Peninsula, South Island, New Zealand. Oil painting by Dai Wynn on canvas panel. 20.3 cm high by 25.4 cm wide by 0.3 cm deep approximately. (8 inches by 10 inches). 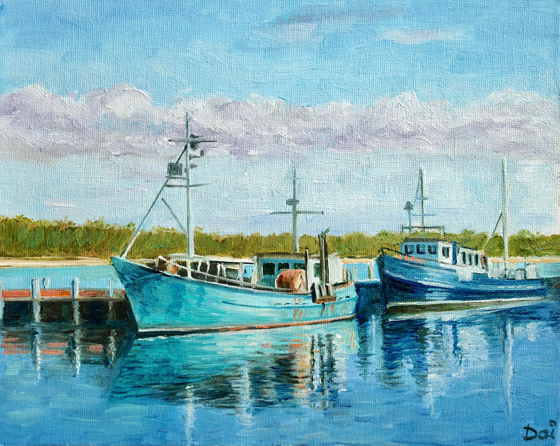 Oil painting by Dai Wynn of fishing boats at the wharf in Lakes Entrance, Gippsland, Victoria, Australia. This is a much simplified composition which leaves out the large, modern commercial trawlers, covered in various contrivances and paraphernalia, docked on the other side of the depicted smaller, colourful craft. Even then, I have not painted in much of the radio, radar and navigation equipment festooning the masts. 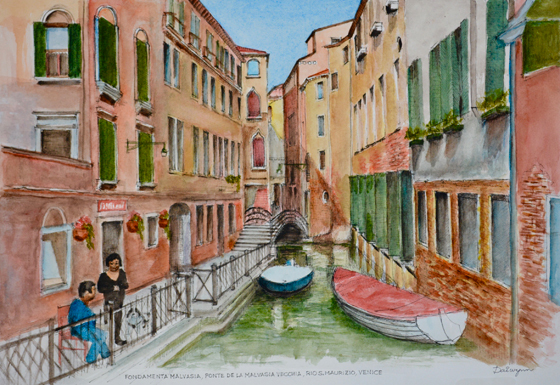 A neighbourly conversation on the Fondamenta Malvasia beside the Rio San Maurizio in Venice. In the background is the Ponte de la Malvasia Vecchia with cast iron balustrades. Watercolour based on a freehand pen and ink drawing by Dai Wynn on 300gsm smooth Arches paper. 29.5 cm high by 42 cm wide by 0.1 cm deep approximately. A3 standard size.